Like any promotion, Amanda Medlin's jump from office manager of the Greenville Drive to team and business operations manager has come with questions. And because the role is newly created, there have been a lot of them. But if Medlin, who's entering her fifth season with the Class A affiliate of the Red Sox, feels like she's on shaky ground, she picks up her phone and connects with Donna Kirby, the vice president of operations of the Pensacola Blue Wahoos (Double-A affiliate of the Twins). "Being office manager was great because I had a finger in every pie and learned something from everybody," Medlin said. "But to take that and move it into team and ticketing and business operations, it's the perfect time to have somebody at [Kirby's] level to draw information from." The pair is linked through Minor League Baseball's Leaders Inspiring Future Talent Mentorship Program, which partners women at the relatively early stages of their careers (LIFTees) with more experienced women (LIFTers) for an official year-round relationship. Stemming from the Women In Baseball Leadership Event committee that's created networking opportunities during the Baseball Winter Meetings and the Promotional Seminar, LIFT is in its first season. The inaugural class of 34 was announced in November and the partnerships officially began in January. Minor League Baseball manager of data and business processes Belicia Montgomery and events and partnership coordinator Jessica Nori spearhead the program and were responsible for finding matches in the large pool of applicants. "We had maybe 130-160 applications and we went through every single one really thoroughly," Montgomery said. "We spent about a month on that, because we wanted to make sure we paired [partners in a way that] a true, genuine, holistic relationship could be formed. We wanted to pair women who can truly learn from each other. We have women in big markets like Charlotte, North Carolina, and women in small markets like Burlington, Iowa. We wanted to pair women from Double-A or Triple-A with women at Class A or short-season teams." They also were careful to match potential LIFTees' professional interest with the experiences and skills of potential LIFTers, which involved more nuance than one might guess. "There were unique cases where one person was in group sales, but she'd just gotten a promotion and wanted to be paired with somebody with an HR background, because in her new role she was going to be overseeing people for the first time," Montgomery said. "She wanted somebody with a lot of experience recruiting, promoting, managing people. That was one where if we'd just looked at the title and said, 'She's in sales, let's put her with sales,' we would have missed that detail." Jessica Nori and Belicia Montgomery spearhead the program from MiLB's Florida headquarters. That level of dedication might be surprising in two people sorting through scores of applications while carrying on with the everyday tasks of their demanding jobs, but they knew this was important work. Montgomery had benefited from her relationship with mentor Beth Peretta of Grace Autosport, whom she connected with through the Sports Business Journal LeadDog Mentoring Challenge in 2017. "I thought it was a great idea and another way to extend connections year-round. 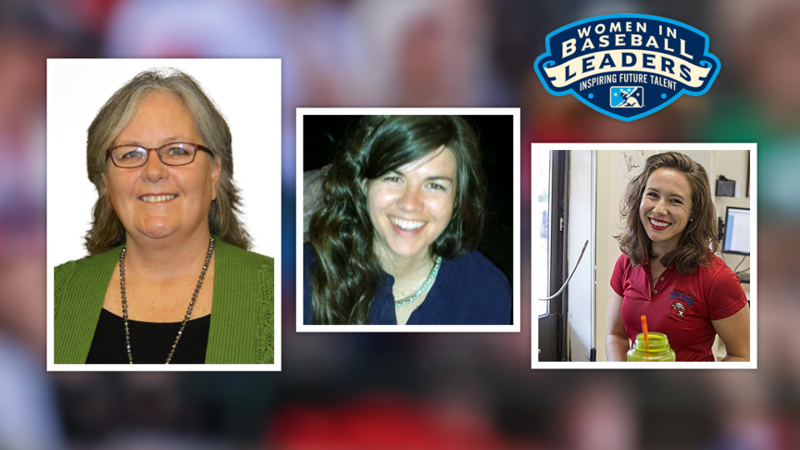 I presented it to the [Women in Baseball Leadership Event] committee. The committee was on board, so we presented to [president and chief executive officer] Pat O'Conner. Pat said, 'Go for it! Whatever you need, I'm here to support this.'" Montgomery also had seen an urgency for this kind of program firsthand. As a child in Birmingham, Alabama -- yes, she's heard all the jokes about her last name -- she was a regular at Double-A Barons games, beginning when she was a toddler and her mother took her to see Michael Jordan suit up for the hometown team. Her love of Minor League Baseball continued through her undergraduate studies at the Univeristy of Alabama at Birmingham and inspired her to choose the University of South Florida for her master's of business administration and master's of sports and entertainment management degrees; USF is about 25 miles from the Minor League Baseball head office in St. Petersburg. "I went to a lot of sports job fairs and stuff, and I noticed that there were not a lot of women, not a lot minorities," she said. "I love being in spaces where there aren't a lot of people like me, because by being there, I can make room for more people like me." Kirby, Medlin's LIFTer, worked for major corporations like Disney and Warner Bros. before coming to the Blue Wahoos in 2012, and she sees the program as a chance to ensure more women gain the skills and confidence they need to develop successful careers in baseball. "Season in and season out, we see a lot of young talent coming up through sports," Kirby said. "In terms of guys [compared to] girls coming up, it can be really unbalanced, so it's great to have a way to help those girls who want to stay with sports." Barely three months into the official start of the relationship, Medlin already has noticed the benefits. "The goal is to get my feet on the ground securely with the new position and what that entails," Medlin said. "I'll overthink stuff or be a little more hesitant in things. She's like, 'No, you're good. Here's what you need.'" The LIFT Program was intentionally designed so that each partnership could be as intensive or casual as the participants see fit, with Minor League Baseball providing guidelines and resources on how to build relationships. In the Medlin-Kirby case, which involves the LIFTee in a challenging new role, they began with weekly calls, which have gone biweekly and will go monthly during the season ("But I understand that I can always reach out if I want to talk about anything," Medlin said). Samantha Fletcher, Portland Sea Dogs ticket office coordinator, is excited just for the resource and networking connection. That makes sense, considering the way she found her job with the Double-A affiliate of the Red Sox. After majoring in politics at Hillsdale College and working on a campaign out of school, she went to the 2016 Baseball Winter Meetings in the Washington, D.C., area keen to transition into a job in baseball. Toward the end of the week, she hadn't landed one she really wanted. "I had a couple offers, but I ran into [vice president of communications and fan experience] Chris Cameron and the people from the Sea Dogs at the Gala at Nationals Park," Fletcher recalled. "They were talking about their flight, so I told them I was [born in Maine] and we had the Maine conversation. They said, 'Oh, who are you here with? Who are you working with?' I said, 'No one, yet,' and they told me they had an opening they hadn't posted. "The big takeaway was that you have to talk to people -- networking is so huge. Any opportunity you have to connect with other people in the Minor League community, you have to take advantage. We do move around a lot, or we could, and you never know who you're going to run into later." Fletcher, who's paired with Triple-A Pawtucket senior director of ticket operations Samantha Saccoia-Beggs, also has special cause to recognize the importance of women in visible roles in the male-dominated sports industry. "I was at a baseball game sophomore or junior year of high school, and I always loved the sport," she said. "My mom pointed out that there were ladies doing stuff in the office and on the field, and apart from being a ball girl at Fenway, I hadn't thought of any opportunities." If LIFT helps a new generation of young women grow up knowing baseball is open to them, the program will be a smashing success. "We want to recruit women in Minor League Baseball, retain women in Minor League Baseball and have women get promoted in Minor League Baseball as a way to get more women GMs, VPs, CEOs," Montgomery said, "and as a way to get more representation in our industry that many would argue is not there." More immediately, it's making a direct impact on the inaugural class of women. "What I've gotten out of it, I'm a lot more in tune to my abilities as a leader," Kirby said. "It makes me happy, and I'm happy to share with anybody who wants to talk. I will talk until the cows come home and until things are resolved in whatever issue [the person is] having. I always felt like that was second nature to me, and this program has made me develop those skills. ... I've never physically met Amanda. That being said, I feel like I've known her my whole life. I feel like, in a way, Amanda is me 20 years ago. Whatever she's getting out of this, I'm getting triple back. It's been really a neat program."